The American Heritage Center recently completed a finding aid for and digitized the entirety of the Baker and Johnston Photograph Collection. The Baker and Johnston Photographic Studio was operated out of Evanston, Wyoming, in the late 1800’s by Charles S. Baker and Eli Johnston. Baker and Johnston photographed a variety of subjects but are best known for their series of portraits of Native American leaders, primarily from the Shoshone, Arapahoe, and Apache tribes. The collection contains the original glass plate negatives as well as copy prints. Portraits included in the collection include Chief Washakie and his family, Oiti, Codsiogo, Sharp Nose, and Geronimo. Click here to view an inventory for the collection and link to the digitized images! 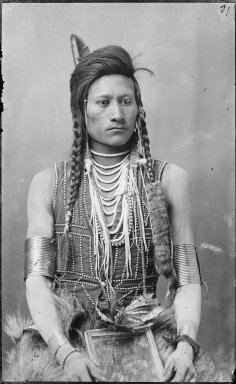 This entry was posted in American Indian history, newly digitized collections, newly processed collections, Wyoming history. Bookmark the permalink.